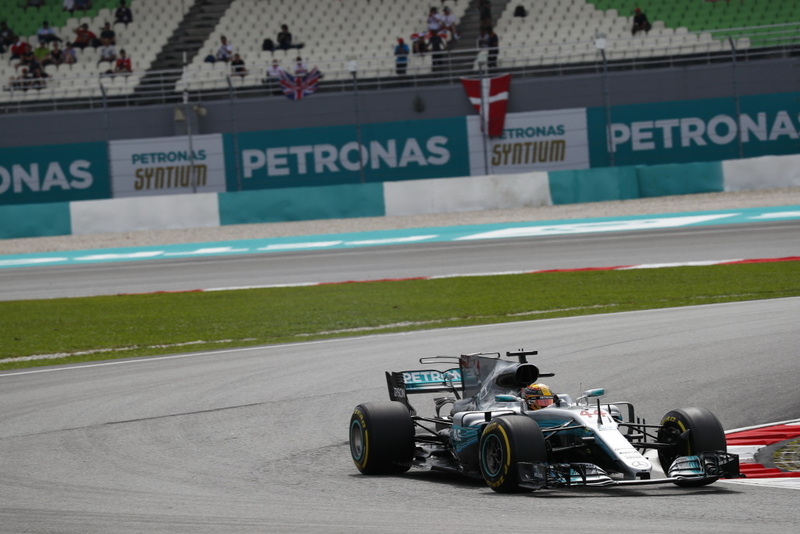 The Malaysia or Malaysian GP? 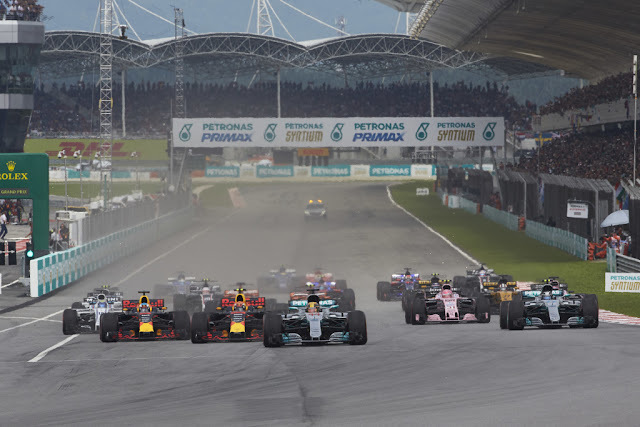 No-one seemed to know which one it was this weekend but we did know one thing - it was the last GP that would be held at the Sepang International Circuit, as its 19 year reign on the F1 calendar came to an end. It was the first of a glut of new circuits that now own the moniker - ‘Tilkedromes’ but its varied layout has never garnered the critique that many of the other circuits designed since have . Emerging as a destination Grand Prix the Malaysian government has helped to fund the event down the years. Unfortunately, Singapore’s arrival on the calendar has seen a slow march towards its disappearance with the venues not only sharing proximity but as from last year they also shared calendar space. Unable to draw the attention it once did, in a heavily populated Asian arena and claiming that the sport itself has lost its appeal the 2017 race will be the last, at least for a few years. It's sad in a way as the circuit provided numerous challenges from both a driver and engineering perspective. With its mix of low, medium and high speed corners and a high risk of changeable weather conditions making life difficult for everyone involved. 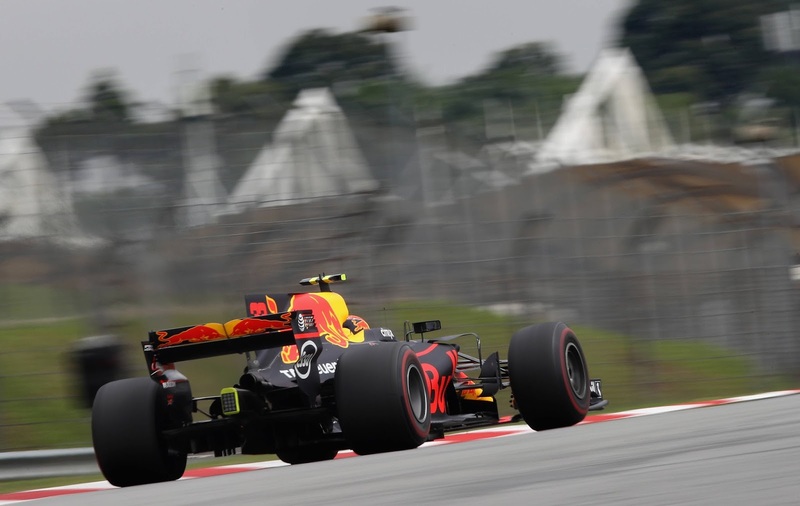 Red Bull meanwhile had very little, having run new parts in Singapore, instead opting not to run their T-Wing, altering the balance of the RB13 to suit the circuits demands. 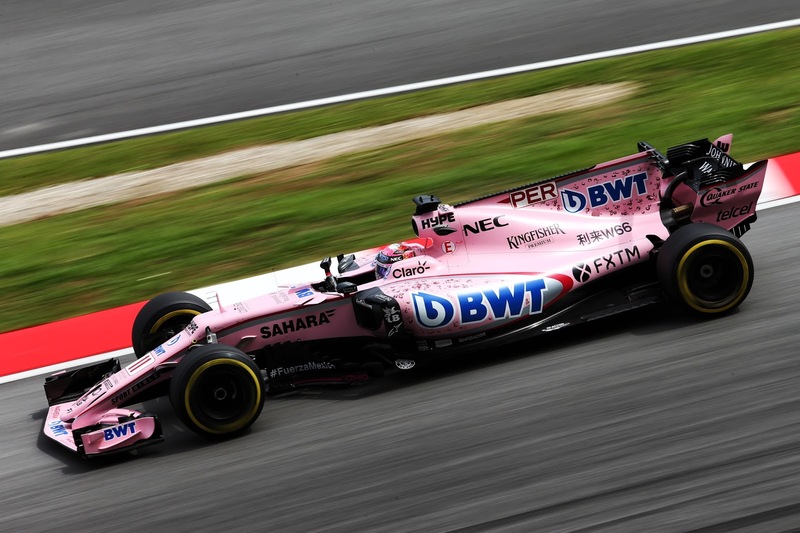 Force India retained their ‘stegosaurus’ engine cover spine introduced in Singapore, whilst making improvements to their bargeboards (not raced) and diffuser. Haas introduced a revised front wing, which featured flaps with the tips squared off altering their effect on the Y250 vortex. McLaren had a new bargeboard design to trial in Malaysia but with only one available it was given to Alonso. The design features a new pre-bargeboard that sits adrift of the main vertical surface, conditioning flow around the cars midriff, whilst the curved anchor bodywork was also revised. With the Silver Arrows drivers lacking the necessary balance from either aero setup (back-to-back tests were done during FP3) they opted to split their strategy. Hamilton ran the older specification and Bottas the new. Up until the start of Q3 the Ferrari drivers looked nailed on to deliver a front row lockout but having seen an issue in the telemetry with Vettel's powerunit in FP3 the team decided to take precautionary action and replace the ICE for qualifying. This would be the Germans final penalty free component and so the team set about installing their latest and greatest iteration, originally scheduled for introduction in Malaysia but put back to Japan. The new design is rumored to be running much more complex 3D printed pistons - a shame then that we’ll never see them. It's a pretty big deal as undoubtedly this option has been chosen as the designers want a mixture of materials or want to create a design that would unmanufacturable with conventional methods. I suspect this is primarily down to the shape of the piston crown as they look to take further advantage of the lean burn turbulent jet ignition system. The installation of this fourth ICE seemingly went without a hitch, in a shorter time frame than would ordinarily be possible. However, as soon as Vettel got out onto the circuit he detected an issue - down on power he immediately instructed the pitwall of a turbo problem. My immediate thoughts were that the symptoms correlated with a boost leak, perhaps a pipe had been left adrift and so the team scurried around the car to try and resolve the problem as the session clock ticked down. Unable to resolve the issue he failed to post a time and would start the race from the back of the grid - not a great way to make ground on Hamilton’s championship lead. Latterly the team established that carbon pipework between the Turbo compressor and inlet was at fault, with a crack allowing boost to escape. It's a problem that shouldn't really exist as the ICE, Turbo and MGUH are shipped to the circuit complete, in order that they be able to be installed and used as quickly as possible. In fact they're rig tested back in Marenello in advance of shipping too, making sure everything is in order. 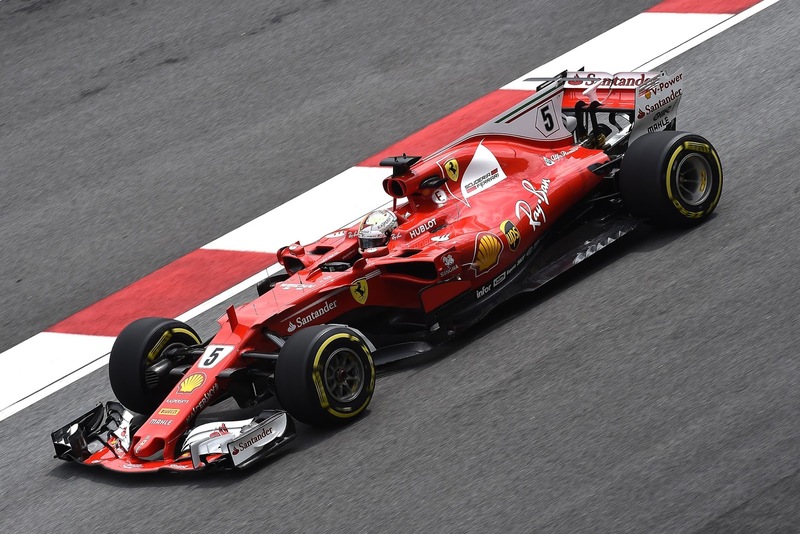 As an aside Ferrari took full advantage of the penalty situation and outfitted Vettel’s SF70H with a new ICE, Turbo, MGUH and gearbox as no further penalties would ensue. The complexion of the race was changed entirely by Ferrari, with the loss of Raikkonen from the front row and Vettel having to make his way back through the field allowing the others to make hay whilst the sun shone. The Finn would have been a likely protagonist for his regular dueling partner - Verstappen as the SF70H and RB13 seemed to be more than a match for one another in every other session. In the opening phase of the GP Hamilton came under pressure from Verstappen and let his engineer know on the radio that he was suffering heavily with ‘derates’ - this is caused when the energy store is not fully topped up in the first few laps of a race and the algorithm prevents full energy deployment as it will become damaging to their energy matrix for many more laps (It's a little more complex with this owing to the energy map between the K and H too but I won't get into it here). The young Dutchman was encouraged to capitalize on this and made quick work of Hamilton, knowing that the Brit would likely yield the position without having to apply maximum pressure, as with the championship at stake and the W08 not performing so well it was a case of damage limitation for the Mercedes driver. Meanwhile, having had a great start, albeit from the drier side of the grid (the grandstands overhang on the left side of the pit straight had led to a situation where that side remained wet, whilst the right side had dried), Bottas jinked to the left of the long first corner and emerged alongside the Red Bull's, taking the high ground into the sharp left hand second turn and setting up a tasty battle in the forthcoming laps between him and his old Formula Renault adversary Daniel Ricciardo. As the race settled down and the correct running order started be established - those that had out qualified their machinery started to shrink back and the entertainment largely came in the form of the lone fast charging Ferrari driver, who made his way upto the back of his first stumbling block - Fernando Alonso in the first points paying position. Vettel had plumbed for the only real option available to him at the start of the race - the soft tyre as this offered him the opportunity to lean on the tyre when he needed against the softer shod runners who'd also be in tyre preservation mode. This is one of the current failings of Pirelli’s tyre selection process as although races like Malaysia are a borderline two stopper it's altogether more sensible to run a more reserved one stop - eeking out and protecting the tyres in both stints, rather than having the pit time loss caused by an extra stop, the potential to run in traffic not to mention the odds increasing that something goes wrong at a pitstop. Oddly Vettel’s SF70H was struggling against the grunt of the Honda powerunit, when you'd expect him to breeze by. However, at this stage the DRS was nullified, as Alonso was also picking it up from the train of cars in front - a situation that would not unfold if DRS was changed to a number of uses per race may I add. As Vettel finally made something stick on Alonso it was Hulkenberg who jumped the proverbial gun, pitting early from what he described as a set of unbalanced super softs and switching onto a set of softs - notice he didn't go for another set of supers locking into a two stopper instead hoping he could make that set cling on for 46 laps. Of course this started the usual chain reaction as no-one wanted to get caught with their pants down and be undercut by the Renault driver - locking everyone into a Sunday afternoon drive as they managed their tyres and fuel levels. Meanwhile, the German now having his path cleared for him by the early stoppers was eyeing up a certain Finn on the menu, who was struggling to maintain the pace set by those ahead suffering with the tyre temperature yo-yo effect where the surface and core temperatures don't match, bleeding grip, performance and lap time. Not wanting to blink knowing that a switch to the slower soft tyre could put them back in the races with the Red Bull’s ahead, Mercedes played a game of chicken that would inevitably lead to Bottas being caught by Vettel. 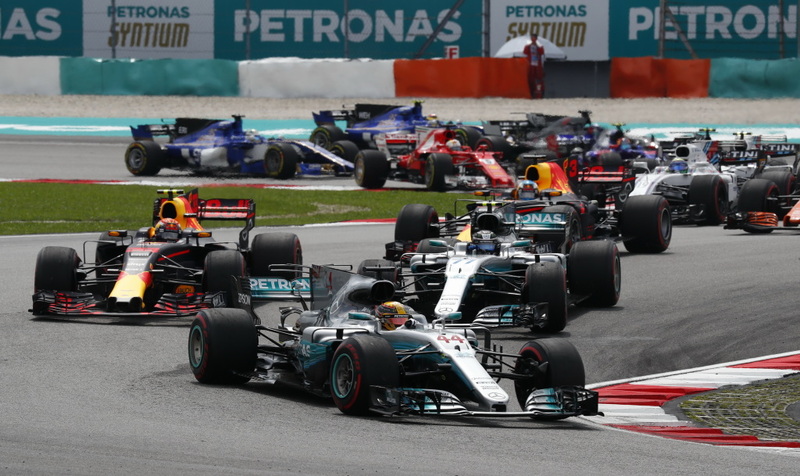 Bottas became the sacrificial lamb as they effectively asked him to protect Hamilton's position, with the two battling and losing time to one another Mercedes pitted Hamilton and crucially got him out ahead of the battle. 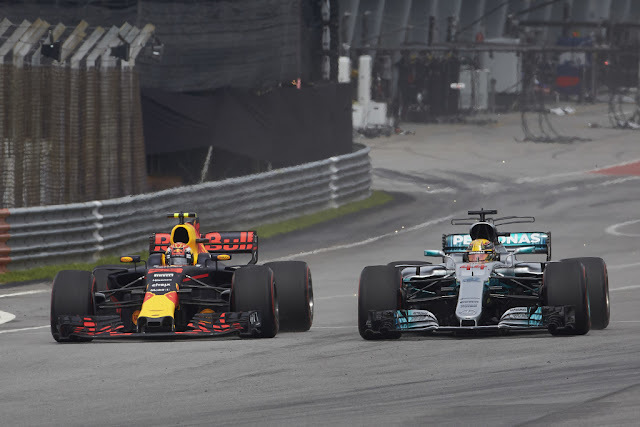 Vertstappen boxed with Ricciardo quickly following suit pitting for a fresh set of soft tyres as both Hamilton and Ricciardo traded fastest laps. Vettel was now past Bottas and set about taking the rest of the life out of his now thoroughly worn softs in order to build enough of a gap to Perez that he wouldn't fall into his pit window. 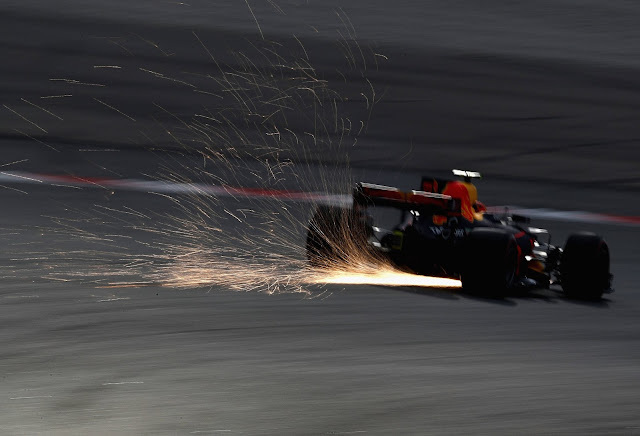 Once on the super softs it was to become a race to the finish between him and Ricciardo who now notably had a piece of bodywork lodged under the front edge of the floor/splitter, as sparks flew from the underside of the car. Ever canny the Aussie knew the battle was coming and did the most to protect his position from the Ferrari man, but unbeknownst to him Vettel was also struggling - asking his engineers for one last push, a last gasp effort to minimize his points loss to Hamilton. The Ferrari driver had short-fueled his car by all accounts improving his lap times in the early stages but scuppering his progress toward the end of the race and leading to some rather aggressive lift and coast moments to make the finish line. Then in the bizarrest of moments we had the collision on the in lap between Stroll and Vettel, both of which wanted to occupy the same piece of tarmac. Not only did this destroy the rear end of the Ferrari and put him in jeopardy for another gearbox penalty in Japan, he also decided to carry his steering wheel off with him as he cadged a lift back to the pits with Pascal Wehrlein. Luckily for Vettel it wasn't reported to the stewards and so no further action was taken, in all likelihood it would have only have been a reprimand in any case but strange nonetheless, especially as he mounted the wheel but then went back for it.